When it comes to structural foundations – water and soil don’t mix. Water flow around and beneath structures will inevitably result in erosion of soils causing instability, uneven pavement, and even sinkholes. If left alone, washout wreaks havoc on soil subgrade and underlying supporting soils. No other method for mitigation of soil erosion offers the same environmentally safe, zero excavation, long-lasting results that URETEK ICR provides. Team URETEK is trained to quickly diagnose & mitigate soil erosion at the source. URETEK’s patented structural polymer is applied through a non-invasive, zero excavation injection process to seal joints and cracks, ensuring a lasting repair. As the URETEK polymer expands to fill voids and structural cracks, it also displaces water and moisture with no absorption. Within 15 minutes of application the polymer reaches 90% strength eliminating the need to prepare the site or remove water ahead of time. With the URETEK hydro-insensitive polymer in place future washout and soil erosion complications are eliminated. The best time to contact URETEK is before soil erosion occurs. Our soil stabilization solutions The URETEK Method® and The Deep Injection Process® are just as effective for preventing future soil erosion complications as they are for treating existing problem areas. Contact Team URETEK to help you develop a prevention plan that works for erosion prone soil. 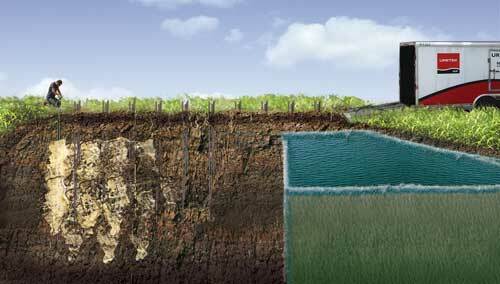 DO YOU HAVE SOIL EROSION PROBLEMS?